ABBOTTSTOWN, PA 8/13/2016 –J.J. Grasso started on the front row and held off 12th-starting Brian Montieth at the end to score his third career Lincoln win in Saturday night’s 33-lap National Fallen Firefighters feature event in memory of Brandon Little. Grasso dominated most of the race from the pole, leading by as much as a straightaway with five laps to go. But Montieth fought his way through lapped traffic to close onto Grasso’s bumper on the final lap, crossing just 11-hundreths of a second behind the Middletown, DE winner. The two cars nearly touched at the finish line as they crossed with a lapped car. The event actually began with a first-lap flip by Cory Haas just before the rains came, resulting in an hour and-a-half delay. Haas was able to make repairs during the delay and restart at the rear, coming back through to finish 13th. Montieth made Grasso work hard over the final five laps as he closed the gap dramatically, setting up the final front stretch thriller to the checkered. 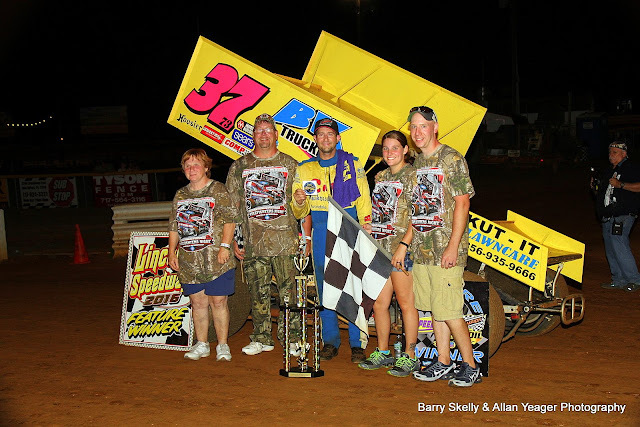 Third through fifth were points leader Alan Krimes, Tyler Ross, and Kyle Moody. 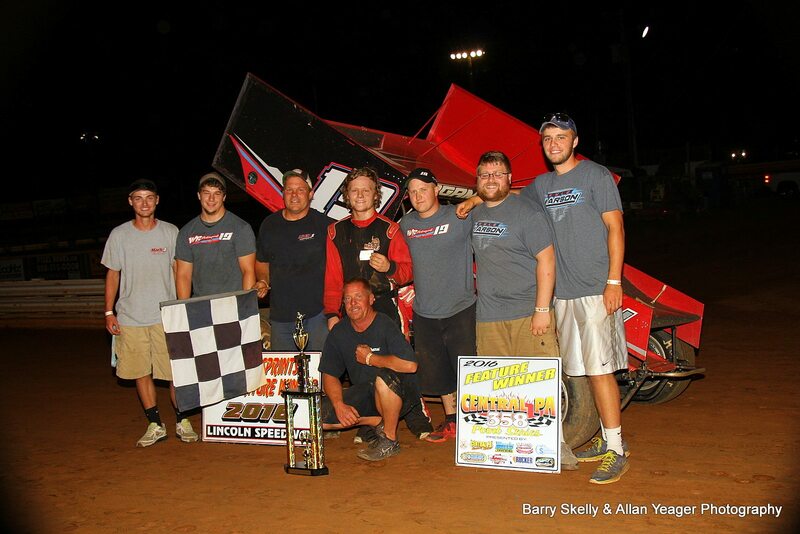 Rounding out the top ten were Billy Dietrich, Jim Siegel, Austin Hogue, Adam Wilt, and Robbie Kendall. Heats for the 24 410 Sprints were won by Tim Glatfelter, Dietrich, and Montieth. Hanover’s Troy Wagaman, Jr. took the lead at the outset and led them all in the 20-lap “358” sprint car feature. But the last seven laps were tough, as tenth-starting Jeff Halligan moved into the runner-up spot, closed on Wagaman, and took the lead from Wagaman with a slider in turn two late in the race, only to have Wagaman race back by Halligan down the backstretch. Halligan settled for second, with 12th-starting Matt Campbell, point leader Chandler Leiby, and Jeff Rohrbaugh completing the top five. Heats for the 28 358 sprints were won by Nick Palmerino, Adrian Shaffer, and Tyler Walton. Fred Cullum took the lead from polesitter and race-long leader Randy Doty with two laps to go and scored the win in the 20-lap All-American Outlaw feature. Doty, Bryan Green, Fred’s son Justin Cullum, and Gary Moreland, Sr. crossed second through fifth. Heats for the 11 All American Outlaws were won by Fred Cullum and Green. Lincoln Speedway swings back into action this Wednesday night, August 17th, with a special mid-week show featuring the USAC DIRT MIDGET SERIES (co-sanctioned by ARDC) plus an EMMR Exhibition. Gates will open at 5:30 PM, and time trials getting underway at 7:30 PM. Then next Saturday night, August 20th, it will be Pepsi Night along with York County Racing Club (YCRC) Night as the ALL-STAR CIRCUIT OF CHAMPIONS come to Lincoln Speedway to take on the Pennsylvania Posse. Central PA Legends will round out the night’s racing action. Gates will open at 5:30 PM, followed by time trials at 7:30 PM.